"The Blood of Martyr is the Seed of the Religion"
9 July is the Shaheedi Diwas of Shaheed Bhai Mani Singh Ji. He is a great Singh of Guru Gobind Singh, Who sacrifice his life for the good of Khalsa or Sikhisam. father's name is Bhai Maidaas Ji. His grand father was also a great Yodha (Bir Bahadur), who got Shaheedi while fighting a war against turks in the time of Sixth Guru Shri Guru Hargobind Sahib at 1628 in Amritsar (According to Sikh Mishinary Collage). Bhai Mani Singh has 12 Brothers. From which 11 got Shaheedi in the Battlefield. So we can think that how lucky Bhai Mani Singh was, Whose grandfather is a Martyr, Whose 11 Brothers are Martyr, Whose 7 Sons are Martyr. 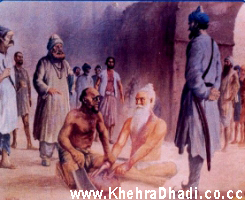 When Bhai Mani Singh was 13 years old, his father carry him to Shri Guru Har Rai Ji. When Mania(Bhai Mani Singh) laid down his head on the feet of Guru Har Rai, Guru Ji said that He is full of Power and One day he will gain fame in the World. At the age of 15 years, Bhai Mani Singh married to "Bibi Sito" Who was the daughter of Bhai Lakhi Rai, Village Kharpur. Lakhi Rai was that Great Guru Bhagat who brings the dead body of Ninth Guru Shri Guru Teg Bahadur Ji. In the Sewa of 10th Guru Shri Guru Gobind Singh Ji, Bhai Mani Singh showed his bravery in the Battlefield of Bhangani in 1688. Bhai Mani Singh Ji's Brother Bhai Hathi Chand Ji got Shaheedi In this war. After staying for one Month in Paunta Sahib(Near Yamuna), Bhai Mani Singh went to Anandpur Sahib with Guru Ji. In 1690, When Bheem Chand begged help from Guru Gobind Singh Ji in the War of Nadon. In the group of that Yodha's Bhai Mani was also included. Sikhs and Bheem Chand won in this War. Guru Ji was greatly impressed from the bravery of Bhai Mani Singh in the War of Nadon and give him honour of "Diwan". In sammat 1756 Bikrami, Bhai Mani Singh got Amrit from Guru Gobind Singh Ji and Changed from Mania to Mani Singh. On this Day Bhai Mani Singh also gives his Five Children to Guru Ghar, that was Bachittar Singh, Uday Singh, Azab Singh, Azayab Singh and Anik Singh. When Bhai Mani Singh was old, He met with a other Mukhi and decided that next Diwali will be celebrated in the Harminder Sahib, Amritsar. When Bhai Mani Singh and other Singhs talked about this with the Suba Zakaria Khan. Then Suba Zakria Khan asked them for 10,000 Rs. as a Tax and He allows Sikhs to celebrate Mela for 10 days, If Sikhs will give that Amount of Money. Bhai Mani Singh agreed to give the money. But in the Lahore, The Dhrohi of Sikh Panth "Haibhagat Niranjaia" told to Suba that they can't get any another chance to defeat all Sikhs at one time. So the Day of diwali is a good time to Destroy Whole Sikh Panth. The Suba of Lahore " Zakaria Khan" likes that and think that He will destroy all the Sikhs in the Amritsar with the help of Tops on the day of Diwali. This message was given to Bhai Mani Singh by the Suiya (Secret Reporter). Bhai Mani Singh wrote the letters to all Sikhs and told them to not come in Harminder Sahib on the moment of Diwali. The day of Diwali has come. The Singhs that can't get the message come into Harminder Sahib. According to the planning of Suba, Lakhpat Rai attacked on the Golden Temple. Bhai Mani Singh dislike it and send complaint to the Suba about it. But Suba asked about 10000 Rs. Bhai Mani Singh asked Money for What? We can't celebrate our Festival then why we'll pay? Bhai Mani Singh Was arrested with other Singhs. They are offered either to accept Muslim Religion or Death. Singhs proudly choose "Death". They brought to Nakhas Chowk in Lahor, So others can see the Shaheedi of these Singhs. They Cutts every little part of Bhai Mani Singh's Body. And thus Bhai Mani Singh got the Shaheedi. He was an ordinary, Brave fighter and his Shaheedi was also Ordinary. That was only one of World who got Such different and anokhi Shaheedi. Thanks. Kindly Share it to your Other Friends and Let them know about This Great Shaheed of Khalsa.